The Association is formed of like minded people, interested in collecting locks, keys and allied subjects. The main reason we have been together for so long is our fascination with the hobby, and as we wanted to extend our collection and knowledge members felt they could achieve this better by joining together as a group. This way we can make contacts and find what other collectors have to sell or want. They too can add to our information, providing details from their knowledge and experience in collecting. Also, several of our members are in the lock trade and have acquired skills and experience that can be passed on by advice to others. Acting together as a group enables us to arrange visits in which members may participate. Some months ago we arranged to view the locks and related exhibits at the Science Museum and V & A in London where members enjoyed a great Saturday outing in the City. We also attended the Master Locksmith Association's Expo 2006 at Telford's Conference Centre in Shropshire on Saturday 8th April 2006. 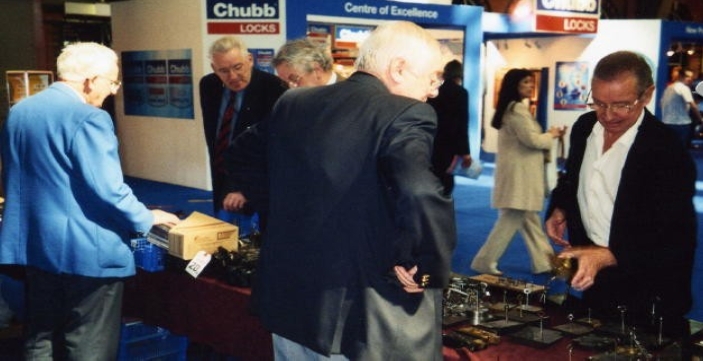 Part of the Lock Collectors tables at the UK Master Locksmiths Exhibition 2006. Last September the European meeting was held in Nuremberg and provided another opportunity to meet up with collectors from Europe and several others who had made the journey from U.S.A. All who attended seem to find the experience of this very interesting and it provided a most enjoyable week-end. The venue for September 14/16th 2007 is the excellent Lock Museum at Rouen in France, which will give another opportunity for our members to travel abroad to join with others of like interest, helping to widen our experience and knowledge apart from creating a great time together! We shall look forward to that, and additionally with especial interest when it is 'our turn' to accommodate the European Collectors at a meeting in this Country during 2008. Apart from these events the Association's members met up twice in 2006 at the former Lock Museum at Willenhall during June and November. These meetings provided a good opportunity to discuss future events and how best the Association might develop in the future. A member of the Friends of the former Museum kindly arranged to fire up the Workshop furnace for us and showed how locks were manually made in Victorian times. Please see the Future Events Page for other proposed visits and indeed, if you decide to join us we hope you will participate and bring forward ideas for future progress. The Association publishes a high quality journal for members every three months named 'The Lock Collector'. In addition to regular meetings, we hope to arrange a number of visits to places likely to be of interest to members. Please contact Tony Beck (lockcollectors@outlook.com) for details.